Electric Vehicle Video in the making by Wisconsin Department of Natural Resources / Wisconsin Department of Natural Resources. Filming EVs in San Jose. Filming Sparrow EVs at Corbin. Californians look for energy alternatives 3/27/2001 BBC Article on Solar Electric (PV) and Electric Vehicles! My True Zero Emission Vehicle (TZEV) Toyota RAV4 EV Electric Vehicle and home are powered by the 100% renewable, Zero Emissions Electricity (ZEE) 30kWh/day Solar Electric PV rooftop system. Investment payback in California of 6 years, 12% annual return. 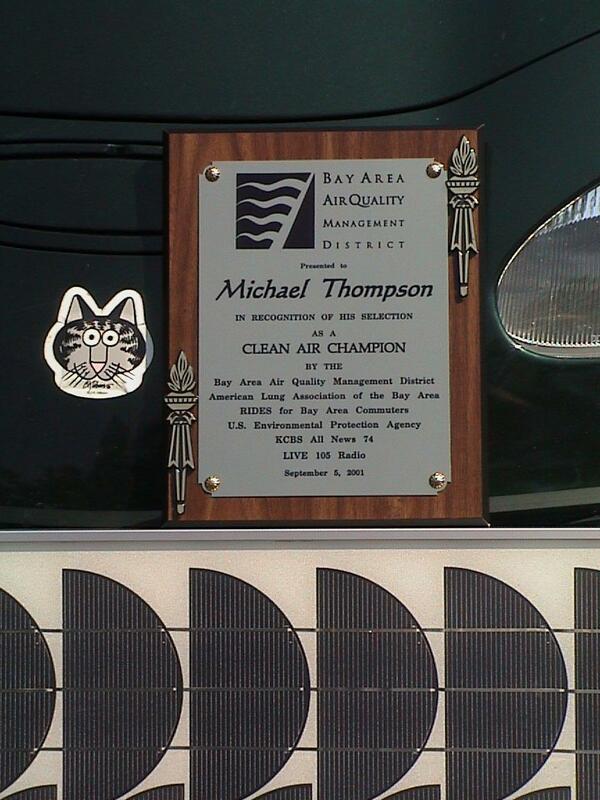 San Jose Mercury News Article Solar Electric (PV) and Electric Vehicles! on page 27A of the print edition Sunday, January 14, 2001 newspaper with photos. EV / HOV info currently just Georgia images. David Rezachek EV, alt energy links, etc..
Electric Lawn and Garden tools More pollutant reduction / $ than an EV! Article (.pdf) on importance of using the right primary fuel for fuel cells. Archive of site I created for AC Propulsion Inc with old info. US DOE EV America Vehicle test data May be pessimistic in some cases due to testing at consistently high ambient temperatures. Phil Karn's excellent analysis of CA grid powered EV vs. Gasoline ICE Note the analysis is much easier if your EV is 100% renewable energy powered - TRUE ZERO EMISSIONS! 100% cleaner than a gasoline car! BAAQMD $5,000/vehicle fleet buy down incentive! Home Power Magazine EXCELLENT source for alternative energy. Current issue freely downloadable. CEERT Information about green electricity. Green Mountain Energy My new renewables power provider. More info here when auto manufacturers make grid rechargeable, plug in hybrids available. Plugging your vehicle into the California Electric grid is 99%!! cleaner than a gasoline car from the well to the wheels. Compressed Natural Gas is cleaner than the current Honda Insight and Toyota Prius hybrids. Only Electric and Compressed Natural Gas Vehicles are clean enough to use the HOV carpool diamond lanes with a single occupant under CA AB71.